VMwareReady Certified software for compliant email archiving. Meets regulatory, legal, IT and corporate policy requirements. 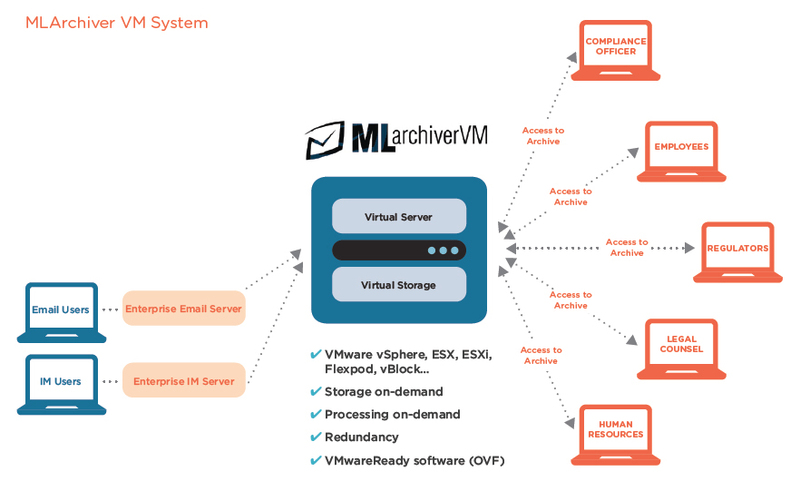 The Message Logic MLArchiverVM combines industry-leading archiving and compliance monitoring with the scale-on-demand VMware virtualization capabilities to deliver a powerful, long-term solution to your email archiving and legal discovery requirements. Maintain your company’s competitive edge by choosing the best virtualization solution that meets your business requirements today – and can grow with your business tomorrow. MLArchiverVM is an intelligent archiving and compliance monitoring system that speeds up investigations, reduces litigation costs, manages compliance policies, and cuts IT operational expenses – reducing business risk. Analytics are a unique feature of Message Logic. MLArchiverVM provides real time analytics on categories, as they process into the archive to create intelligent, meaningful data for business operations. Added features include real-time alerts, and policy enforcement. 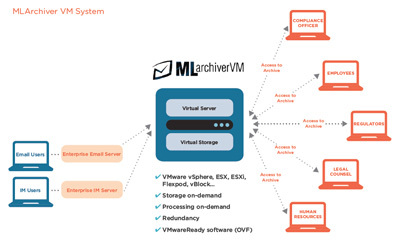 MLArchiverVM intercepts all inbound and outbound emails and instant messages as they are communicated and routes them to the application and your virtual server/storage environment where they are retained for the required statutory archiving term, which is typically between three to seven years. MLArchiverVM provides accurate, comprehensive, real-time archival access plus sophisticated search and review tools to identify and flag message content. MLArchiverVM can process millions of messages and archive hundreds of gigabytes per day with high availability, low-fault tolerance and extreme resiliency. Better Utilization of Existing Servers – Consolidate severs instead of buying new hardware. Virtual appliances take advantage of unused capacity. Lower Operating Cost – Achieve considerable savings due to the reduction in electrical, cooling, and facilities costs. System management and training costs may also be reduced. More Environmentally Friendly – VMware customers reduce energy costs and consumption by up to 80% by placing more than one virtual appliance on a server. Eliminates Hardware Obsolescence – When your email archiving appliance requires faster or better hardware, the existing server may be reallocated to new applications. Unlimited Archiving Storage With Your SAN – Never worry about running out of disk storage on your email archiving appliance. Virtually unlimited storage is available because disks can be added easily to a storage area network. Easy Back-up and Disaster Recovery – Use your existing back-up and disaster recovery systems to protect systems.